Wrist Rhythm is the next step in gesture-based music. Choose between a three-axis gyro or accelerometer to detect wrist gestures that are converted to rhythmic patterns. 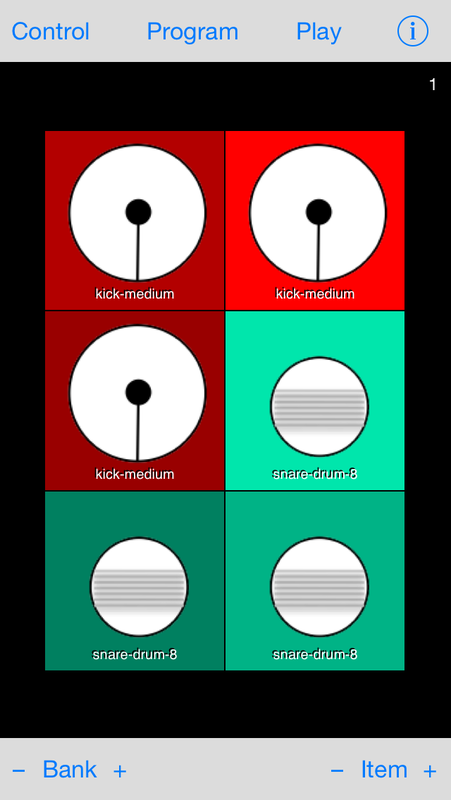 Select between MIDI mode that wirelessly sends control signals to external MIDI devices like drum machines or synths, or an internal sound mode that plays samples from a built-in drum and percussion library. Wrist Rhythm is fully programmable and is capable of storing up to 32 sample/MIDI presets. Here's a quick demo. The device is an iPhone 5 networked via DSMidiWiFi to Garage Band running on a Mac Pro. When the gyro is selected the rotation gestures trigger the device as shown below. 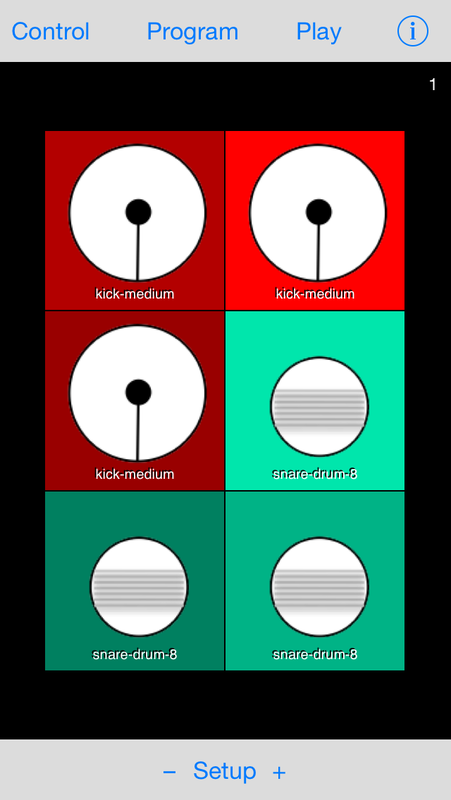 Each gesture triggers a particular pad, which can be programmed to send a wireless Midi control signal to a networked device, or play a sampled sound on the device. The app is core MIDI compatible (between iPhone apps and/or externally networked MIDI devices). The next version will support Audiobus. Future versions will run on Apple Watch for hands-free percussion. To play sampled sounds on the device, tap "Control" on the top command bar, and flip the Midi switch off as shown below (left). To use the app to wirelessly trigger external Midi devices flip the Midi switch on (right). When the Gyro switch is on, the x-, y-, and z-rotation rate signals from the device gyro control the app; otherwise the x-, y-, and z- components from the accelerometer are used. 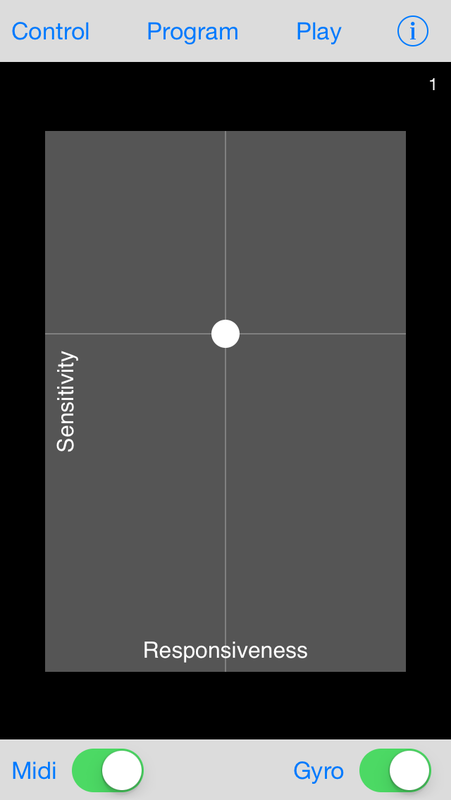 The response slider (left-right) smooths the gyro/accelerometer control signals. When the slider is to the right the response is quicker. 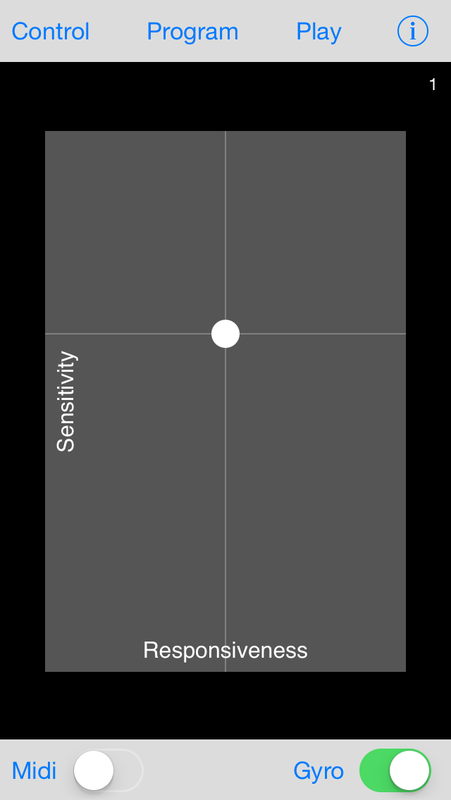 The sensitivity slider sets the sound on/off threshold. When the slider is down it takes more effort to trigger the sound. The figures below show the corresponding "Play" screens. The setup control at the bottom moves through the 32 presets. Tap "Program" on the top command bar to change the Midi notes or sampled sounds assigned to each pad in the current set. 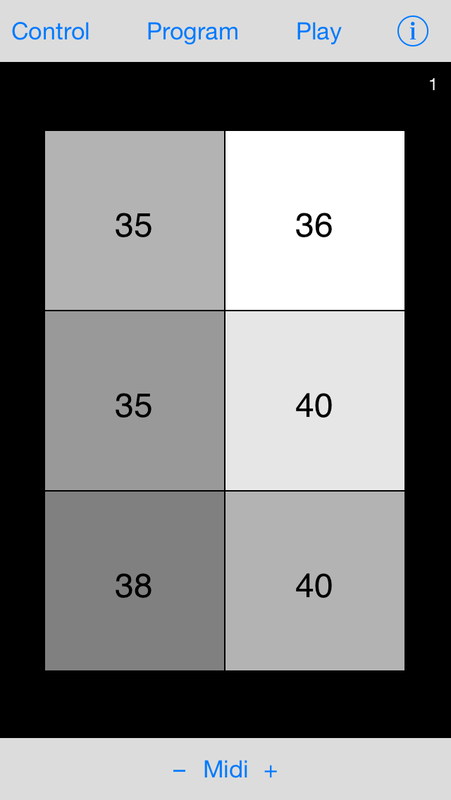 The setup number is displayed at the upper right. 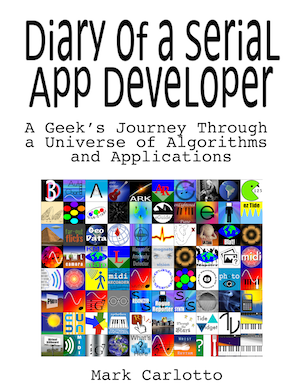 Touch the pad you wish to program. In Midi mode tap the -/+ controls at the bottom to change the Midi note assigned to the pad. The value "-1" turns the pad off; i.e., does not trigger a sound when the corresponding gesture is detected. When Midi mode is off tap the Bank -/+ control to cycle through different sound banks and the Item -/+ control to change samples in the bank. After you're done programming a pad or a setup touch "Play" on the top to save the settings.